The December 2015 legislative elections placed Chavismo in an unfamiliar situation. For the first time in 17 years it became an electoral minority. 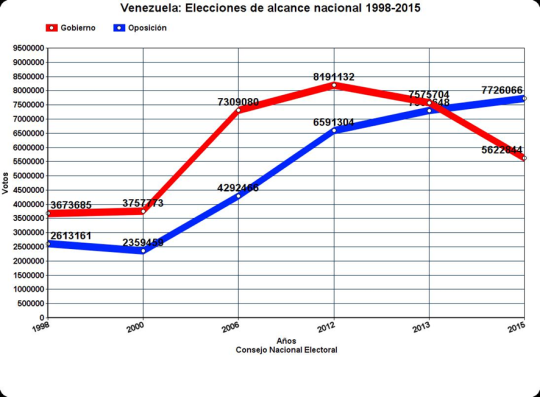 As can be seen in the figure above, it was inevitable that sooner or later the voting trend lines of Chavismo and the opposition would cross. However, few predicted that the “Supreme Commander’s” electoral slate would end up with two million votes less than their opponents. In hindsight it is not hard to understand why. According to the National Statistics Institute’s (INE) numbers for 2013, poverty increased for the first time in ten years. The official data shows that in that moment poverty reached 33,1% of households in the country in a year in which inflation was 56,2%. From then on the economic crisis kept getting worse. Six months before the December 2015 elections it was calculated that 12,170,175 Venezuelans lived in poverty. In 1997, a year before Chavismo’s first electoral victory, the INE estimated 11,590,111 Venezuelans living in poverty. In only a few years Nicolas Maduro had squandered the social achievements of Hugo Chávez and was rapidly transforming the Chavista government into a giant poverty factory. It is in this context of economic recession and social regression that the Maduro government decided to increase authoritarianism. While originally acknowledging the result, in the days after the December 2015 electoral catastrophe, leading figures began to suggest the opposition had won because of a “circumstantial majority.” The National Assembly, still controlled by Chavismo, decided to renew, in an irregular manner, the judges of the Constitutional Chamber of the Supreme Court. In May 2016 a “State of Emergency” decree was issued, giving the president far-reaching powers. In October 2016 the National Electoral Council decided to interrupt the activation of a Recall Referendum against the president—an electoral instrument provide for by the 1999 Constitution, which Hugo Chavez himself faced and defeated at the ballot box in 2004. In this same month the CNE announced that the regional governors’ elections, which should have taken place in December 2016, were indefinitely suspended without justification. Both decisions revealed that the Maduro government does not intend to hold elections until they are sure they will win. How would Hugo Chávez have reacted to the December 2015 electoral defeat? We will never know. What we do know is that the Maduro’s administration decided to push forward a model of governance that dispenses with consulting the majority, even if that means abandoning the appearance of democracy. In the December 2015 elections Chavismo received five and a half million votes–an electoral base to be envied by any Latin American party organization. Thus Chavismo is still in position to “reinvent itself” and continue as a major player in Venezuelan politics. But for this they need two things: the capacity for self-criticism, and a willingness to comply with the minimum rules of the democratic game. At this writing neither of these are present. Some voices from inside Chavismo are starting to work in this direction. but still do not have the strength needed to face Chavismo’s more authoritarian sectors. In his attempt to stay in power, Nicolas Maduro is willing to sacrifice Hugo Chavez’s most important legacy: the 1999 Constitution. He is proposing to draft a new Magna Carta in a fraudulent way, and without the strong consensus that existed during the first year of Bolivarianism. If Chavismo were to allow a political transition, in which their more democratic sectors would participate, the institutional framework for reconciliation would be precisely the democratic rules delineated in 1999, that include participatory and pro-active mechanisms that favor the majority. Today these rules are defended by Chavistas and anti-Chavistas alike. However, both of these possibilities–that a renewed Chavismo can continue to be an important actor in the Venezuelan political panorama and for the model present in the 1999 Magna Carta to be the base for reconstruction–will only happen if the international left abandons their silence. In some cases, this left is simply ignorant of the degradation of a governing project that once provided hope to millions. In others, this left is an accomplice. Behind closed doors, members of “critical Chavismo” comment that Nicolas Maduro, and the core elite surrounding him, are digging the grave of Bolivarianism. The opinion of revolutionary and leftist intellectuals, as well as progressive social movements in the region, are key for getting out the message that there will be a future for Chavismo after Nicolas Maduro if they decide: 1) to not self-immolate by trying to keep power, and 2) try to create democratic strategies to recover their capacity to speak to the masses. *Rafael Uzcategui is the General Coordinator of PROVEA, (Programa Venezolana de Educación y Acción en Derechos Humanos).